NITV launches its first ever comedy show next month, Express Yourself with Sean Choolburra and Friends. This will air across three ‘Black Fridays’ this year Friday 13 February, March and November. 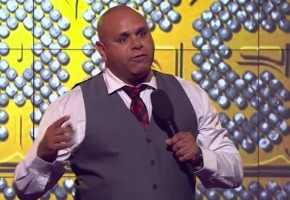 Black Fridays (13 February, March and November) are all about humour in 2015 with NITV’s first ever comedy show, Express Yourself with Sean Choolburra and Friends. Hosted by Sean Choolburra, in front of a live studio audience, this two-part series presents some of the best Indigenous comedians from across the country, alongside musical performances by Maupower and Dizzy Doolan. Episode one (13 February, 9pm) sees laughs from Queensland’s loveable rouge Sam Conway, Torres Strait Island gem Diat Alferink and Adelaide’s irrepressible Kevin Kropinyeri, with episode two (13 March, 9pm) featuring Brisbane rising star Matt Ford, zany Adelaide diva Deborah Bland and New South Wales’ very own funny man Andrew Saunders. Black Friday, every Friday 13 across the year, is the culmination of the Black List on NITV, a series of Australian and international movies stripped across the week.